OLIVIER ZAHM — Is it the first time you will show these sculptures? 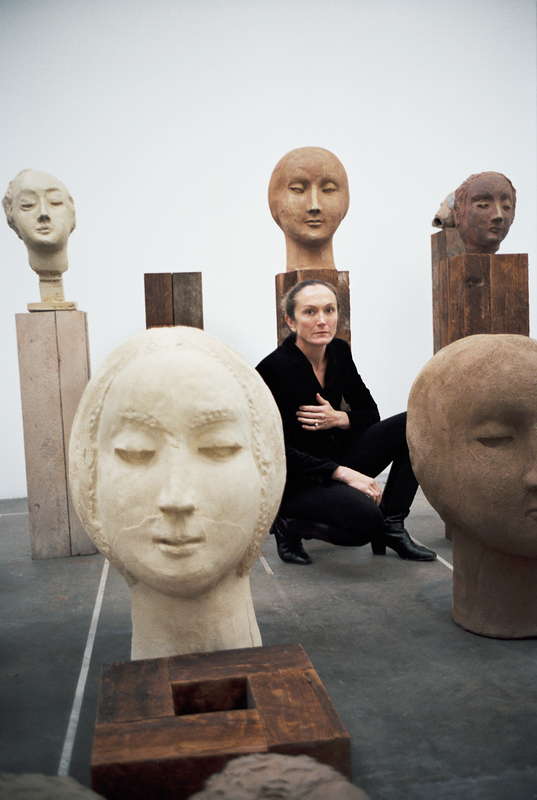 VANESSA BEECROFT — It’s the first time for this new body of work, which is in ceramic. Before, a few were exhibited in bronze. But this is an all-ceramic show. VANESSA BEECROFT — In clay that was fired. OLIVIER ZAHM — And painted? VANESSA BEECROFT — Sometimes painted with beeswax. And there is also painting in oil, but it’s mainly clay and beeswax. OLIVIER ZAHM — You also decided to show the drawings that you’ve kept to yourself for a long time. VANESSA BEECROFT — I kept the drawings for myself at the beginning, in ’96, because I was afraid they’d give the wrong message. It would be too intimate, and I wanted to confront the audience in a more violent, aggressive way. So I kept the drawings for myself because they were like a diary, just for me. It was like a literature piece, and I couldn’t split them. But here I decided to draw on sheets of wet clay, with a pencil or a tool or anything. I carved them quickly, very quickly. I was obsessive about them. I couldn’t stop! A few of these are bad. But I made them because I was angry. OLIVIER ZAHM — It’s about multiplicity. VANESSA BEECROFT — Yeah. Notes. 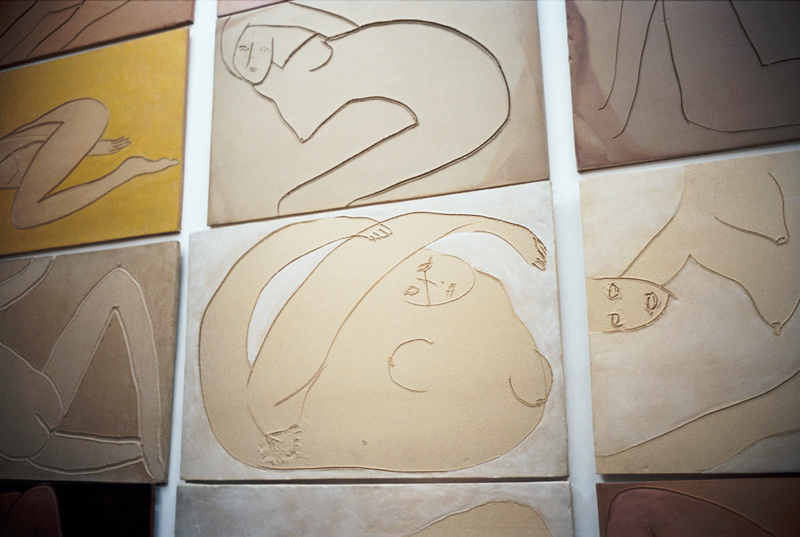 Notes on the same subject — the woman and her body and her mood. OLIVIER ZAHM — So, is this an archetypal woman? Or is it more of a self-portrait? VANESSA BEECROFT — The drawings sometimes turn into me, sometimes they turn into black women, sometimes they’re very soft and sensual, sometimes they’re very crazy, upside-down. But sure, it’s a self-portrait. VANESSA BEECROFT — Yeah. Unconsciously. Completely unconsciously. In the sense that, if you give me a piece of paper, I draw it. [Laughs] Without thinking. Now I’m doing the same with very large oil canvasses. OLIVIER ZAHM — It’s your freedom. VANESSA BEECROFT — I don’t want to think. OLIVIER ZAHM — So, it’s a whole new body of work. Maybe for the first time, you’re accepting a traditional medium of sculpture, and paintings? VANESSA BEECROFT — This is a very good question because, in fact, I still don’t. Today is the day before the opening — the invitation is going out today. It’s like a performance again. The construction is still happening… And I keep changing the bases. I do not accept it. I’m still fighting with Federico [Spadoni, Beecroft’s husband and founder of the gallery], who wants me to finish the installation. And I keep saying, “This is not finished.” We have a real conflict, problem, with that, because for me it’s a living process. OLIVIER ZAHM — You don’t want to finish the installation? VANESSA BEECROFT — In a way, because for me, it’s research. So, the moment that the painting is finished, or I hang something, I feel suffocated. I need to continue. The research is still ongoing. And so there’s the same melancholy that I find when I print the photograph of a performance. Because the performance is gone, it’s not there anymore. So that photograph is nothing — it’s just a memory. It’s a relic. I find that when I hang a painting, I think: “I need the next painting. This is old.” And I’ve had this anxiety all my life. OLIVIER ZAHM — Your boyfriend, Federico, is opening a gallery space. It will be his first show in this space. It’s a sort of collaborative project, in a way. It’s also located in the same place as your own studio. So, this is a very personal move toward the public. In a way, you open yourself to the public. VANESSA BEECROFT — But I’m not involved in the gallery because I have absolutely no spirit of commerce. So I cannot be involved. I can be involved at the level of relationships, introduce friends, but I cannot ever think of money. It makes me very afraid. I can’t do that. It would go against my beliefs. Federico has a background as an artist. He will collaborate with each artist… Each artist will make the show with him. OLIVIER ZAHM — Like he collaborates with you? OLIVIER ZAHM — And forces you to present this work. VANESSA BEECROFT — And I was very flattered because we fought a lot… Almost the end of the marriage, and of everything. But I’m always so flattered that he opened with me, and he wanted to do that. VANESSA BEECROFT — And that was the best compliment! “I will do your show, and then your show, and then your show.” And I thought, “Isn’t this fun?” And so even if we fight, I’m extremely flattered. I feel like I’m in a museum! I feel this is my top museum. OLIVIER ZAHM — Art and life are not totally divided with you. VANESSA BEECROFT — That’s what Jeffrey Deitch used to say — that I used to live my art, it was always one. And it was. OLIVIER ZAHM — You always refused to enter the art market in a very commercial way. You maintain a distance. VANESSA BEECROFT — Oh, thank you for saying that because I always felt people misunderstood that. And they associated me with wealth, for some reason. Because, indeed, I am now in East LA, a very poor area, with absolutely no budget. Why? I don’t know because I do like money, in a sense. I have nothing against it, but I really can’t compromise.